With all eyes on the build-up to last night’s United States presidential elections, China’s once-in-a-decade leadership transition has found itself comparatively sidelined in the international media frenzy. The generational hand-over of power for the world’s second-largest economy during the National Party Congress that opens tomorrow in Beijing, however, is by no means of mere secondary significance. For the 59-year old Xi Jinping, the man tipped to succeed Hu Jintao and lead China for the next 10 years, assuming the position of secretary-general of the increasingly fragmented Communist Party (CCP) will prove no easy task. China’s new leader will inherit a formidable economic superpower more willing to assert itself globally and challenge the United States over issues pertaining to Syria, Iran and North Korea. So too, however, will he take over responsibility for a host of national and international challenges – not least of which will be the task of navigating a peaceful settlement to present tensions with Japan and Taiwan over claims to the disputed Senkaku/Diaoyu/Diaoyutai islands. More close to home, there is massive discontent in the Chinese “autonomous” regions of Tibet, Inner Mongolia and East Turkestan because of Beijing’s restrictive measures. Examples of such unacceptable encroachment include brutal restrictions on religious freedoms, forced settlement policies, as well as excessive mining activities and natural resource extraction which have contributed to environmental degradation. Despite persisting repression of grassroots mobilisation on these issues, so-called “village activism” has proved unrelenting, and China’s new leaders will find themselves increasingly hard-pressed to continue responding to regional instability with violence. Not much is known about the man about to assume the reins of China’s ruling party. As the privileged son of popular revolutionary hero Xi Zhongxun, Xi Jinping was given the nickname "princeling". He was a student of Chinese politics from an early age, and when his father was purged, he was sent to work in the countryside. Before joining the CCP in 1974, Mr Xi studied chemical engineering at Tsinghua University. A Member of the Standing Committee since 2008, he has also been Vice Chair of the Central Military Commission since 2010. 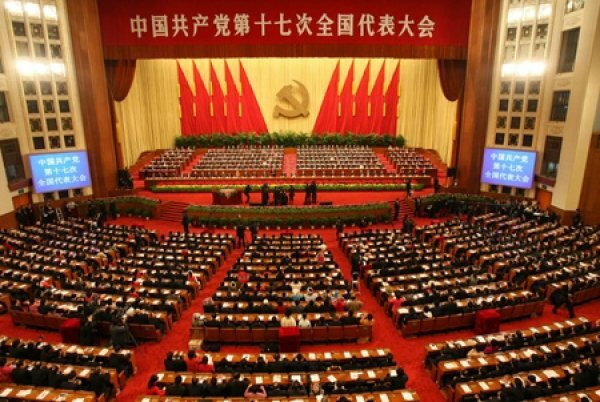 For the CCP, the few months leading up to the National Party Congress, convened once every five years, have indeed proved nothing short of tumultuous. Xi Jinping’s two-week disappearance in early September resulted in the cancellation of various meetings with foreign dignitaries, among them Hillary Clinton. China’s 82 million-strong Communist Party, the largest political party in the world, has also suffered serious losses of legitimacy under the leadership of Mr Hu. The party’s increasing fragmentation, as well as widespread corruption within official party ranks, has contributed to public perceptions of its waning authority. It has been estimated that in 2010 alone, 180,000 mass protests and riots took place across China, with demonstrations over environmental issues increasing by 29% since the late 1990s. Casting a particularly dark shadow over the upcoming leadership transition has been the scandal involving Bo Xilai, the former Chongqing Municipality Party Secretary accused of covering up his wife’s murder of British businessman Neil Heywood. An important closed-door meeting of 365 senior party officials this week just days before the Party Congress, made official an earlier decision to expel Mr Bo from the Communist Party. The four-day gathering also saw the official expulsion of former railway minister Liu Zhijun, who was dismissed last year for disciplinary violations. Both men are now set to face criminal charges and await trial. The change in China’s top leadership is unlikely to improve the situation of the country’s minority regions, which have persistently been denied self-determination. Political assimilation campaigns involving opposing population transfers of Han-Chinese settlers and migrant workers from ethnic minorities, in addition to religious persecution, economic exploitation, environmental neglect and violent suppression of peaceful activism, demonstrate hostile state policies that contravene both the Chinese constitution and international norms. International conventions have further been flouted as individuals that fled violence in the Tibetan-and Xinjiang Uyghur Autonomous Regions were extradited from countries such as Cambodia despite UNHCR protests. Once in China they face arbitrary detention, opaque trials without defence and the risk of execution. Democracy activists, sometimes EU citizens, have been detained in third countries such as South Korea following pressure and unsubstantiated criminal charges from Beijing. Meanwhile, hackers have also attacked websites publicising activists’ work. Xi Jinping has stated a commitment to tightened Party control, particularly in China’s minority regions. Support for civil-political and environmental reform in the autonomous regions will be low and there is a general trend towards repressing individual and group freedoms in the name of fostering “stability”. Existing dialogues with China should therefore prioritise the situation of Chinese minorities. Critics have dismissed the government’s campaign to reduce regional economic disparities via regional development as little more than a covert effort at “internal colonisation” that seeks to bring China’s minority regions under central government control for the purpose of exploiting the rich natural resources and mineral deposits in these areas. Mr Xi has earned himself a reputation as a straight-talking, business-oriented and hard-working politician. Known for his zero-tolerance attitude to corruption, he reportedly warned officials in 2004 to “Rein in your spouses, children, relatives, friends and staff, and vow not to use power for personal gain”. Should Mr Xi indeed come to assume the leadership of the Communist Party, it remains to be seen whether he will live up to perceptions of his straight-up and industrious character, and strive to mend the many fault-lines within the CCP and within the country that have made themselves visible over the course of the last decade.